The users of the pool are only AIT community which includes AIT staff, students and their families, the visitors at AITCC (strictly outsiders are not allowed). All users have to register before using the swimming pool and the swimming pool staff may also request for the AIT ID card for verification. Proper swim wear is required. 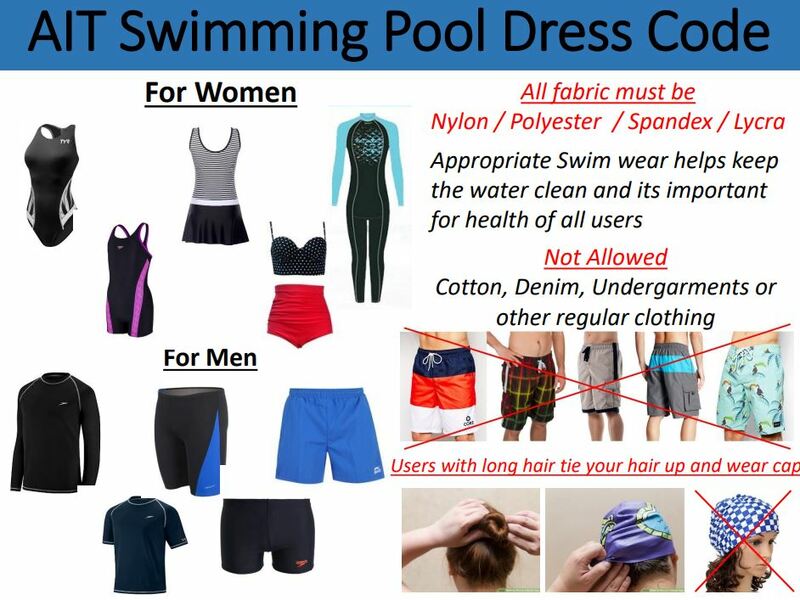 No outerwear including cut-offs or shorts will be allowed. Bringing liquor or any intoxicating drinks is prohibited. Individuals intoxicated with liquor are not permitted to use the pool. Lifeguards and/or security guards have the authority to prevent intoxicated individuals from entering the pool area. Smoking is not permitted at the pool. Take a shower before getting to the pool. Take off shoes or slippers before entering the pool deck. No screaming, running, rough play or any activity that would disturb other users and prevent general swimming. No spitting, spouting water or blowing nose in the pool. Children must be accompanied and supervised by parents or guardians at all times. Inexperienced swimmer must be accompanied by experienced swimmer in the pool. Persons suffering from contagious diseases or those with open wounds are strictly prohibited from using the pool. Running and playing around the edge of the pool are not allowed as these may result in injury due to falling in the water or falling on the concrete. For swimming training lesson, prior permission has to be taken from OFAM.